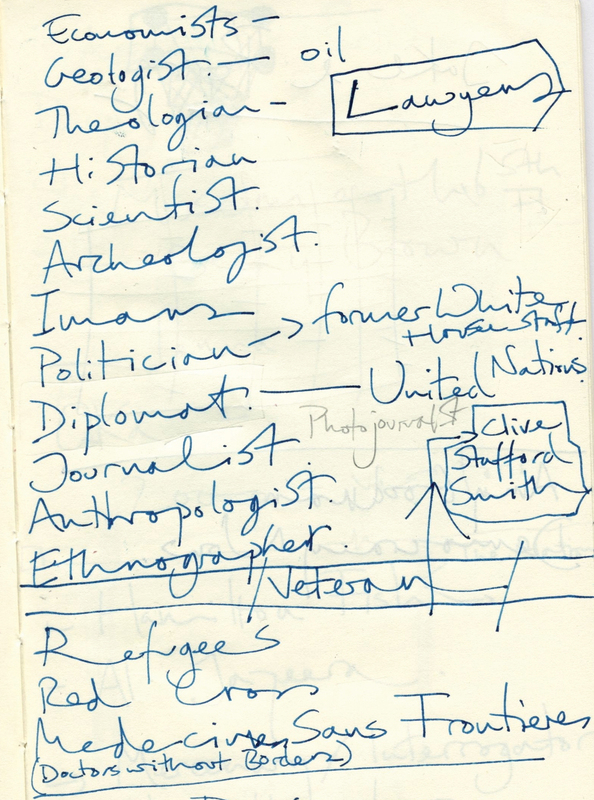 It Is What It Is: Conversations About Iraq is a new work by British artist Jeremy Deller. The artist has invited a diverse group of individuals—including Iraq war veterans, journalists, scholars, and Iraqi nationals who have first-hand experience of Iraq—to take up residence at the Hammer Museum with the express purpose of encouraging discussion with visitors to the Museum. Jordan Elgrably, cofounder of the Levantine Cultural Center, is working with Deller and the Hammer to organize these experts. Elgrably, a Los Angeles-based writer, has been passionately committed to strengthening Arab/Muslim and Jewish relations for many years and has written on the topic extensively and organized many lectures and conferences about the region. Several confirmed participants include Issam Al-Askari whose family held many top positions in the Iraqi government prior to fleeing in 1958, Manal El-Shawaf Karim a Baghdad-born businesswoman who got her Master’s in Architecture at UCLA, and Sean Huze who served in Iraq from 2001-2005 and has since authored several critically acclaimed plays including Sand Storm: Stories from the Front and Weasel which debuted at The Kennedy Center's Page 2 Stage Festival. His third play, The Dragon Slayer, addresses post-traumatic stress disorder brought on by the experience of combat in Iraq. The remains of a car that was destroyed in Iraq will share the courtyard with the resident guest experts. This object is meant to stimulate dialogue and ground conversations in reality. From March though mid-April, Deller traveled aboard an RV (the destroyed car hitched to the back) with two Iraq experts and a writer, who documented the journey. The RV stopped at various cultural institutions in cities including Washington, DC, Philadelphia, New Orleans, and Houston along the way to continue the conversation on a national scale, arriving at the Hammer Museum in April. 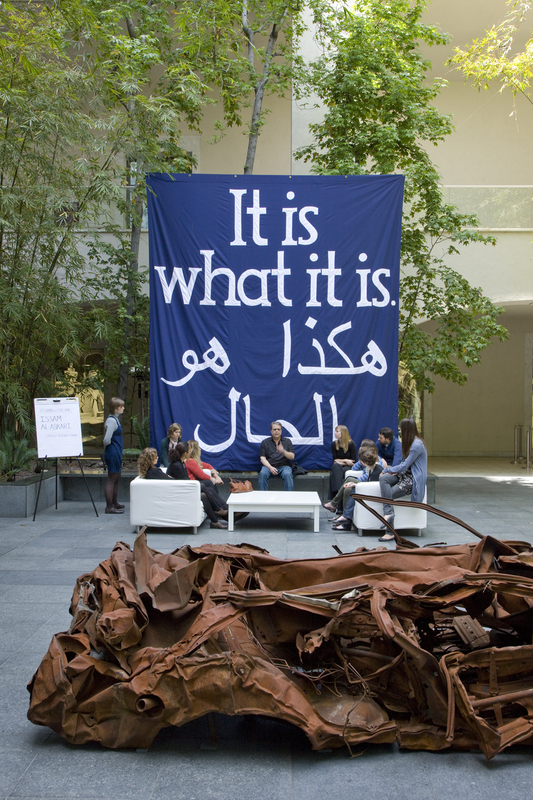 It Is What It Is: Conversations About Iraq is part of the Three M Project – a series by the Hammer Museum, Los Angeles; the Museum of Contemporary Art, Chicago; and the New Museum of Contemporary Art, New York, to commission, organize, and co-present new works of art. It Is What It Is: Conversations About Iraq is curated at the New Museum by Laura Hoptman, Kraus Family senior curator and Amy Mackie, curatorial assistant, and for Creative Time by Nato Thompson, curator. The project is presented in collaboration with Creative Time. From April 21-May 17 come to the museum during the scheduled times below to speak with a guest expert. See biographies below to determine who will be present during the given hours. Many experts will be present more than once. Saif Al-Hakim, a graduate of Cal State Northridge with a BA in cinema and television arts, is an entrepreneur, television producer, and director who worked and lived in Iraq following the U.S. invasion in 2003. He is the former CFO of the Beladi Satellite Channel and ran his own production company in Baghdad. Al-Hakim participated in several Iraqi government reconstruction task force projects and remains in contact with Iraqi news media and various businesses. Many of his relatives have worked in government dealing with various political factions. During his years in Iraq he observed life under occupation as lived by both Iraqis and U.S. military. Jerry Quickley is an internationally known performance poet, journalist, and radio talk show host who has worked with Russell Simmons’s Def Poetry Jam. Un-Embedded, his one-man show about his experiences in Iraq as an independent reporter, has won acclaim in performances at the REDCAT Theater, Los Angeles, and other theaters nationally. Un-Embedded is an unflinching account of an Iraqi society ravaged by war and occupation and is the second play in a planned trilogy on Iraq, the first being Live from the Front. Quickley hosts the KPFK drive-time radio program Beneath the Surface. Yasin M. Alkalesi, Ph.D., has taught archaeology and classical and colloquial Arabic for more than 30 years and has been a senior lecturer at UCLA. Born and educated in Baghdad, he worked for the Iraqi Museum on numerous foreign archaeological expeditions and directed Iraqi archaeological fieldwork in northern Iraq, later studying archaeology at Yale University. His publications include The Court of the Palms: A Functional Interpretation of the Mari Palace, as well as Modern Iraqi Arabic: A Textbook and the Iraqi Phrasebook: The Essential Language Guide for Contemporary Iraq. Through his company ARABICO, he has offered language translation and cultural consultation services on Iraq and the Middle East to a wide range of constituents. Audie A. Attar is a sports agent representing top NFL football players based in California. He is currently director of West Coast operations at All-Pro Sports & Entertainment Inc. Attar attended UCLA on a full athletic scholarship for football, earning his BS in sociology. He was there during 9/11 and was a major media focus as he learned to bridge the growing gap of misunderstanding between the American and Arab/Muslim populations around him. Attar is currently an MBA candidate, with a concentration in dispute resolution, at Pepperdine University's Graziado School of Business and Management. His father is Shia, and his mother is Sunni, which he claims makes him a "Sushi." Currently both of Audie's parents live in two different parts of Baghdad, Adhemia and Khadmia. Jodie Evans is the cofounder with Medea Benjamin of CODEPINK: Women for Peace. She has worked on behalf of community, social justice, environmental, and political causes for more than 35 years. Her book Twilight of Empire: Responses to Occupation includes her journal entries from her trips to Iraq. She cofounded the Occupation Watch Center to bring news from the streets of Iraq after the U.S. invasion. She serves on the boards of Rainforest Action Network, Drug Policy Alliance, Institute for Policy Studies, Women’s Media Center, Sisterhood Is Global Institute, and 826 LA. A mother of three, Evans is a harpist, gardener, and potter when not working to end war. Paul Batou, a native Iraqi artist, received a degree in pharmacy from the University of Baghdad, where he was inspired by many teachers and artists studying there. In 1980 he had his first art show in Baghdad. During his time in the capital, Batou showed his work at numerous galleries until he was forced into service as a medic during the Iraq-Iran war. In 1989 Batou, with his family, left Iraq and moved to Los Angeles. Here he continues to create art and write poems that inspire those close to him. 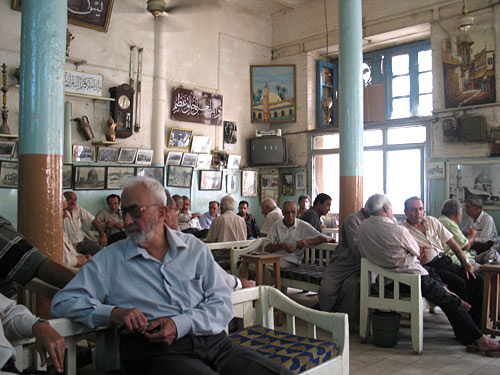 In 2007 he published a book of art and poems, entitled My Last Thoughts about Iraq. Manal El-Shawaf Karim is a Baghdad-born businesswoman from Pacific Palisades who got her master’s in architecture at UCLA, where she went after receiving her undergraduate degree at the University of Baghdad. In Baghdad she worked at the National Center for Engineering and Architectural Consultancy. A member of the prominent El-Shawaf family, who are Sunni, she grew up in the days when Saddam Hussein was not yet a household name. Her father was a member of the Iraqi Parliament. The El-Shawaf home was located right along the Tigris, in today’s Green Zone, and Manal remembers how ethnically mixed her neighborhood was, with Jewish, Shia, Christian, and other neighbors. Tania Baban-Natal is a book artist and graphic designer who received her BFA in communication design from Otis College of Art and Design, Los Angeles. Her artist’s books are held in private, institutional, and international collections, including those of the Getty Research Institute, Otis College of Art and Design, the University of Southern California, Brown University, and the National Gallery of Australia. Baban has worked in the field of graphic design and advertising for more than two decades, including 13 years as an art director and designer with the National Football League’s Creative Services Group. She is the owner of Atelier Baban, an art and design studio specializing in handmade invitations and art cards. Sean Huze served in the U.S. Marine Corps from 2001 to 2005 in the infantry field with the Second Light Armored Reconnaissance Battalion. In 2003 he deployed as part of Operation Iraqi Freedom and saw action from Nasiriyah to Tikrit. Huze was awarded a Certificate of Commendation citing his “courage and self sacrifice throughout sustained combat operations” while in Iraq. He received an honorable discharge from the Marine Corps in 2005 related to an injury sustained in Nasiriyah, Iraq. Upon returning, Huze authored several critically acclaimed plays, including Sand Storm: Stories from the Front and The Dragon Slayer, which tackles PTSD triggered by combat in Iraq. D. Carter served four years in the Marine Corps as an enlisted marine in Head Quarters Company, 2nd Battalion, 1st Marine Regiment, 1st Marine Division. He was deployed to Iraq in March–May 2003 to Umm Qasr, Az Zubayr, and Nasiriyah and again in March–September 2004 to Fallujah. He is currently a senior undergraduate political science major at UCLA. Will Hamilton is a full-time student at UCLA majoring in Latin American studies and history. As a maintenance staff sergeant of the U.S. Army Reserves, he has a combined reserve and active duty time of almost 10 years, which includes two tours in Iraq. In addition to his studies and military duties, Hamilton works in the Veterans Resource Office at UCLA assisting other student veterans in integrating into the university and working as student officer in STOMP (Student Mentorship Opportunities and Mentorship Program) helping to encourage other potential transfer students to apply to UCLA. Michael Flores was deployed to Iraq from September 2006 to September 2007 with the California Army National Guard in an infantry unit and served as a combat medic. Having arrived prior to General Petraeus’s “surge,” Flores saw its implementation at the beginning of 2007. He provided medical aid on combat patrols and was charged with the health care of more than 1,000 Iraqi detainees in southern Iraq, near the city of Basra. Flores is currently an undergraduate at U.C. Irvine, majoring in international studies and biology. He is the club president for the Veteran’s Student Union at UCI. Thoraya Al-Essakhi studied English literature and graduated from the College of Liberal Arts at the University of Baghdad. Al-Essakhi worked for the Ministry of Information as a journalist and writer before doing an internship in what was then East Germany. She was subsequently visiting relatives in the United States when Saddam Hussein took power, and she decided to remain in the States. She worked with federally funded programs for job training and placement and later joined her sister Suad Cano in her wholesale import furniture business. Al-Essakhi visited while Iraq while still under Hussein and found the situation safe, if oppressive. Bob Eidson received his BA in economics from the University of Kentucky in 2002 and will receive his MBA from UCLA’s Anderson School this year. Prior to entering business school, Eidson spent three years in the U.S. Army Paratroopers and served 13 months in Iraq. Eidson volunteered for a Scout squad that conducted raids, tribal negotiations, and more than 100 combat patrols. He taught himself to read and write Arabic and often served as squad interpreter. These actions, combined with his calmness under fire, led to his meritorious promotion to sergeant within two years. Eidson lived in Iraqi homes during the entirety of his tour. As squad interpreter, he facilitated conversations between various parties, including Kurds, Turcoman, Assyrians, Shia, Sunni, Iraqi National Guard, local police, and Peshmerga. Mark LeVine is an author, musician, and professor of history at UC Irvine, where he is an analyst of the modern Middle East and Islam. He spent more than a dozen years living, researching, and reporting in the region, living and traveling in Iraq, Israel, the Palestinian Territories, Egypt, Jordan, Lebanon, Syria, Turkey, Pakistan, Iran, the Persian Gulf, and Morocco. Working in Arabic, Hebrew, Turkish, and Persian, as well as Italian, French, and German, he has interviewed senior international political figures, reported from Beirut’s green line, and taught Qur’an to Muslim Brothers. He is the author, most notably, of Why They Don’t Hate Us: Lifting the Veil on the Axis of Evil and Heavy Metal Islam: Rock, Resistance, and the Struggle for the Soul of Islam. Heather Raffo is most famous for the one-woman play she wrote about Iraqi women, Nine Parts of Desire, which she has performed to critical acclaim in Europe and the United States, including the Geffen Playhouse. Her civil engineer father is Iraqi, and her mother is American, both of Christian faith. Raffo holds a BA from the University of Michigan, an MFA from the University of San Diego, and has studied at the Royal Academy of Dramatic Art. Born in America, she has visited Iraq with her family, in 1974 as a young girl and again in 1993. Recently she performed Sounds of Desire about Iraq at the Kennedy Center in Washington, D.C., with Amir Elsaffar. Jabbar McGruder, a former sergeant in a Black Hawk mechanical unit, served in Tikrit, Iraq, with the California Army National Guard during 2005. He took his oath to defend the U.S. Constitution “against enemies both foreign and domestic” to heart and was "obsessed with turning Iraq into a democratic society over the course of the three major elections that were taking place during that time." McGruder was dismayed that no weapons of mass destruction were ever found in Iraq and began to feel that the war was built upon half-truths. When he returned to the United States, he began serving on the national board of the nonprofit organization Iraq Veterans against the War. Hanaa Al-Wardi is an Iraqi-born artist who received her MFA in fine art from Claremont Graduate School in 1990. She exhibits her work locally, nationally, and internationally. Al-Wardi’s work addresses political, social, environmental, and organic issues. She develops her vision through a variety of media, including metal, wood, plaster, ceramic, and paint on canvas. She has completed artwork on commission for public and commercial projects throughout Los Angeles. Her work is permanently on exhibit at the HA Gallery in Alhambra, California. She is also the founder of MOCAA (The Museum of Contemporary Arab Art), established in 2000. Professor Yona Sabar received his BA in 1963 from the Hebrew University in Jerusalem. In 1965 he was awarded a Yale University fellowship to study in the Department of Near Eastern Languages and Literatures, receiving his PhD in 1970. He taught at Yeshiva University and Yale University for two years. In 1972 he joined the UCLA Department of Near Eastern languages and Cultures, serving as a full professor since 1982. He is the author of 14 books and many articles on the languages and literatures of Kurdish Jews in Iraq. He was born in Iraqi Kurdistan and traveled there in 1992 and 2005. Salam Al-Marayati, a native of Iraq, is the executive director of the Muslim Public Affairs Council. He has lectured and written extensively on Islam, human rights, democracy, Middle East politics, the Balkan Crisis, and the Persian Gulf region, which includes Iraq and Iran. His articles and interviews have appeared in the Wall Street Journal, Los Angeles Times, Christian Science Monitor, Daily News, Chicago Tribune, San Francisco Chronicle, and USA Today. He has appeared on radio and TV talk shows—including The Dennis Miller Show, Tonight with Deborah Norville, and Politically Incorrect—and has been featured on C-SPAN and NBC. Jennifer Utz has been covering the Iraqi refugee crisis since the fall of 2006. One of the first journalists to highlight the extent of the crisis, her first report aired on Democracy Now in February 2007. Subsequent reports aired on ABC World News Tonight, France 24, and Current TV. She spent eight months embedded with Iraqi refugees in the Middle East, and her stories appear regularly on the Huffington Post. She recently launched Iraqi Refugee Stories (www.iraqirefugeestories.org), a multimedia website that features first-person accounts of Iraqis describing life in exile. Utz was previously a producer at Democracy Now, the independent news broadcast hosted by the award-winning journalist Amy Goodman. She’s currently producing a feature-length documentary about a gay Iraqi refugee. David Yousif was born in Habbaniyah, Anbar, Iraq, in 1948. He graduated from the University of Baghdad with a BS in chemistry and taught high school chemistry until he was promoted to lab inspector for high schools in 1974. He wrote science articles in Al Huda Magazine in Anbar and Youth Magazine in Baghdad, and was a science trainer at the General Federation of Iraqi Youth. He translated many lab manuals and booklets to Arabic from their original English counterparts. Two months following his retirement in 1990, he was compelled to dislodge his family and successfully managed their exodus, immigrating to the United States in 1997. Yousif is the author of several books about Iraq in Arabic and, most recently, one in English, Born Killer, on Saddam Hussein. Wendy Barranco joined the U.S. Army at the age of 17 and served in Iraq as a combat medic. She was just 19 when she began working as an anesthesia technician at a Tikrit field hospital. During her time in Iraq in 2005 and 2006, she processed many injured soldiers, most close to her own age. In fact, her field hospital treated marines, soldiers, contractors, insurgents, local Iraqi nationals, and sometimes coalition troops. When she returned to the States, she joined Iraq Veterans Against the War and is now studying for her medical degree. Susan Galleymore, the mother of a U.S. soldier, made international headlines by taking the extraordinary and even dangerous step of traveling to Iraq to visit her son stationed on a military base in the so-called Sunni Triangle, north of Baghdad. What she found in Iraq—the horrors of war, which were at once heartbreaking and compelling—challenged her to continue her journey, interviewing mothers in war zones, including Iraq, Israel and the West Bank, Lebanon, Syria, Afghanistan, and the United States. These powerful first-person stories appear in her new book Long Time Passing: Mothers Speak about War and Terror (Pluto Press, 2009) and offer dramatic insight into the impact of war on mothers, families, communities, and cultures around the world. Ann Maria Simmons is a general assignment reporter for the Los Angeles Times. Until June 2007 she was the primary correspondent in the newspaper’s New Orleans bureau, where she spent 14 months covering the rebuilding in the aftermath of Hurricane Katrina. She joined the Times in 1997 as the newspaper’s bureau chief in Nairobi, where she reported from more than 30 countries in East, Central, and West Africa. In 2003, while working in the newspaper’s Baghdad bureau, she survived a suicide bomb attack that killed several people. She returned to Iraq in 2007, reporting from several cities and regions, from Baghdad to Basra, to Yusifiya, and the village of Owesat, in the so-called Triangle of Death. Over the past ten years, Jeremy Deller has archived, examined, and often staged demonstrations, exhibitions, historical reconstructions, parades, and concerts as a way to both celebrate and critically examine them as forms of social action. His work focuses on cultural history—how it is made, recorded, manipulated, and remembered. One of his most well-known works, a re-creation of a battle between pickets and police during the miner’s strike in the north of England in 1984, was subsequently made into a documentary by Mike Figgis and was broadcast internationally. A more recent work, a film about Texas entitled Memory Bucket, won Deller the prestigious Turner Prize in 2004. Hammer Forum Afghanistan: Obama's Vietnam? Conversations Field Trip: The Iraq Conversation in the U.S.